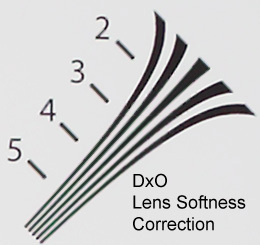 your specific lens must roughly show the same flaw characteristic like the reference lens used by DxO to obtain the correction data. Sample-to-sample variations do exist and will show up as, usually minor, imperfections after the automatic correction phase. However, unlike early versions of the DxO Optics Pro you can still convert all kinds of RAW files as long as the camera is supported (basically all DSLRs except Olympus) so you can still take advantage of all the other quite powerful correction modules. The whole approach is not totally unique (anymore) - four-thirds format lenses have correction profiles already stored in their firmware - certainly the smartest concept of all - and Nikon is pretty much following the DxO path with its latest version of Capture NX (Nikkors only, no third-party lenses). Typically a workflow starts with a "project", a container for all the images to be corrected. 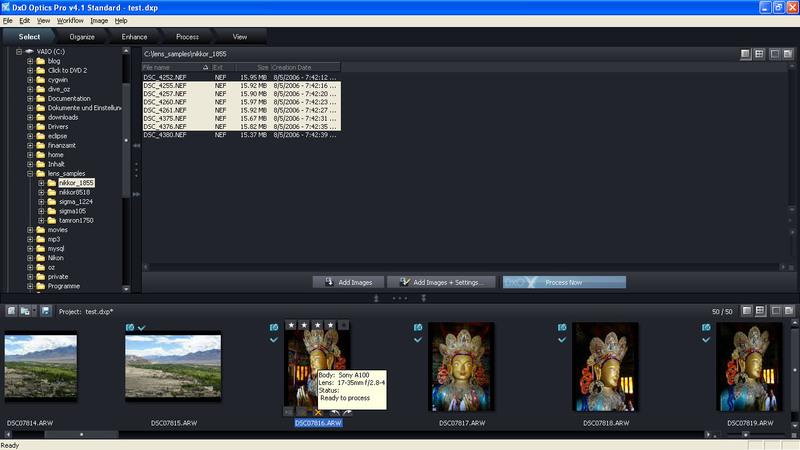 During the "selection" phase the target images can be either drag'n dropped into the project or imported via a folder overview. The generation of the corresponding thumbnails works very fast in version 4.1. Images can be rated and filtered according to the given rating. 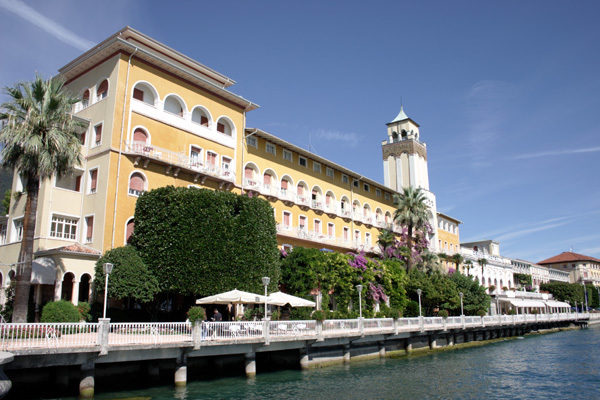 The organized images can then be tuned ("enhanced") either fully automatically or with a varying degree of manual interaction. When selecting the expert mode Optics Pro provides no less than 8 correction aspects (optics, noise, sharpness, exposure, color, lighting, geometry, crop) with several manual control options. Similar to the other applications all corrections are stored (in the project) so you can pickup your work whenever you want. Unsurprisingly the modified and optionally filtered images can then be exported as JPEG, TIFF or DNG to the file system (and if you wish you can do so to all formats at once). The export procedure lasts ages but you can set the export process to low priority and go on tuning new images concurrently. Finally you can also review the exported results. Apart from the rather soft diagonal lines there're also some ugly block-like artifacts where the anti-aliasing (?) filter fades out. 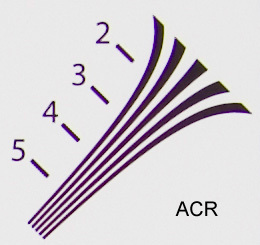 Strictly vertical or horizontal structures are also rendered a bit worse than ACR as you may notice. 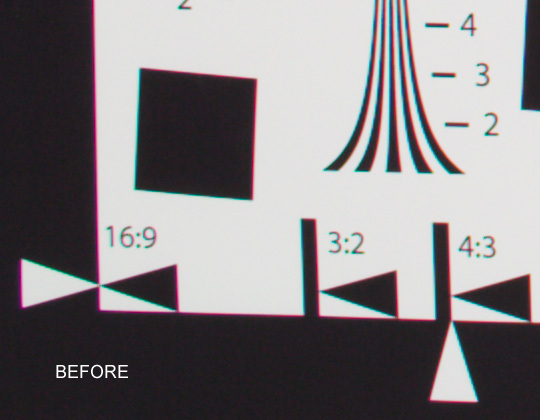 You may argue that exporting an image as DNG RAW file and converting it again via ACR (or so) would solve these issues but unfortunately this is NOT the case because the anti-aliasing (?) problem is, unfortunately, also present in the generated DNG output. Admittedly the issue isn't quite as bad in real world shots as in the rather artificial sample image above and the accompanying noise ratio is very low so unless you're a resolution daemon the results may be good enough. 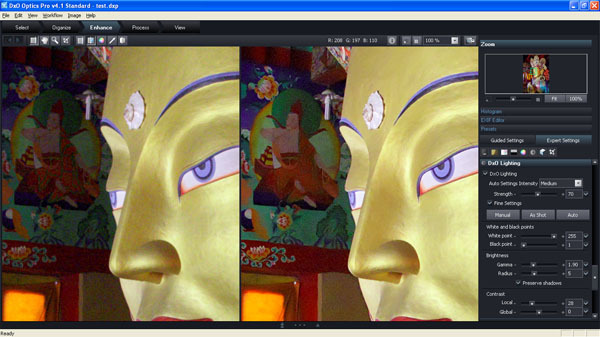 Profiled camera/lens combinations can also take advantage of the "Lens Softness" correction of Optics Pro. 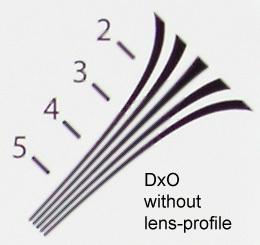 Unlike classic sharpening algorithms it is optimized to the specific characteristic of a lens. Let's assume one of the dreaded kit lenses - typically they're sharp in the center of the image but very soft at the borders. Correspondingly Lens Softness correction applies more sharpening towards the borders. Within limits this is relatively effective. However, the algorithm works rather aggressive (halos) so the control slider should be handled with care - the Imatest results indicate quite pronounced over-sharpening at everything beyond the default setting. (Note: surprisingly the mechanism didn't work for one focal length of a tested zoom lens - probably a bug). 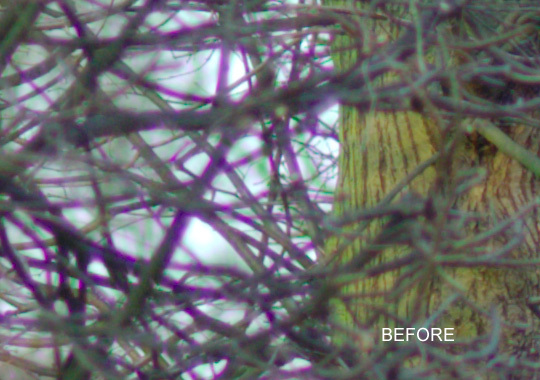 The noise reduction of chroma (color) noise works reasonably well and the luminance noise reduction has a relatively moderate impact on the formal resolution. The default noise reduction is quite aggressive though and should be tuned down when the target image contains fine details. Lateral Chromatic Aberrations tend to be increasingly present towards the edges of an image. The three base colors are often not perfectly focused to the same point resulting in red or blue color shadows visible at high luminance transitions. The default exposure and color engine produces very well corrected results. Naturally there're limits but for those extreme situations or for some fine tuning the application offers quite detailed manual controls for these two aspects. Interestingly DxO Optics Pro also offers to "add film grain" to your digital images in order to produce more natural looking results. I was a little skeptical about this option but here and there a moderate introduction of grain may make sense - it seems to introduce a little more depth not only to low ISO images (sometimes slightly lifeless) but also to strongly noise-reduced high ISO images (which may appear a little watery). DxO Optics Pro is an ambitious application trying to find a high level solution for RAW conversion which certainly makes sense in part because the lens flaw correction is a (more or less) calculable entity where a human interaction isn't really necessary (technically). The application does a very good job for those camera-lens combinations where correction profiles exist - for the rest the solution isn't complete due to the lack of detailed manual controls for distortions and vignetting. Beyond the lens flaw aspect Optics Pro offers a variety of controls for exposure and color correction as well as a pretty sophisticated auto-correction which works surprisingly well for most but the toughest lighting- and exposure-situations. The noise reduction module works also reasonably well. A real weakness remains image resolution which is still not quite up to the standards set by other applications.